A string of beads makes counting easier, and so it is also easier for those who pray, to use a string of beads to direct their thoughts to God. The Rosary is a string of beads on which we pray the Our Father, and the Hail Mary and the Glory Be... . These are special prayers, because the Our Father and Holy Mary prayers were given to us by God. Christ, the Son of God, gave us the Our Father when his disciples asked Him to teach them how to pray. It is certain that Our Heavenly Father hears this prayer, since it was given to us by His Son, and we are His followers. The Hail Mary is in three parts. The first is the divinely inspired greeting which Mary received when the Angel Gabriel saluted her as the Mother of God. The second part was the greeting Mary received when she visited St. Elizabeth upon hearing she was with child. The last part was added in 430 A.D. by the Council of Ephesus, and identified Mary as the Mother of God, asking for her help now and at the hour of death. In the year 1214 A.D., St. Dominic, a holy man, felt very unhappy because no matter how hard he tried, he could not seem to convince people to change their lives and love God, Jesus, and His Mother. During his prayers one day, Mary appeared to him and said, "Dear Dominic, do you know which weapon the Blessed Trinity wants to use to reform the world? In this warfare, the main weapon is the Angelic Psalter (Rosary) which is the foundation stone of the New Testament." The Angelic Psalter (Rosary) was also known as the Psalter of Jesus and Mary, because the fifteen decades, each containing ten Hail Marys, equaled in number the 150 Psalms in the Book of David (David's Psalter). The Book of David is still widely read today. Dominic made the Psalter of Jesus and Mary easier to say be arranging the repeated prayers into three parts of five mysteries each. The Joyful Mysteries recall the events in the early life of Jesus, the Sorrowful Mysteries tell of the suffering and death of Jesus, while the Glorious Mysteries describe God's glory, power, and love. The Rosary encourages both mental meditations on each of the Mysteries, each Mystery containing the Our Father, ten Hail Marys, and one Glory Be. Dominic began to preach devotion to the Holy Rosary, and formed a Confraternity to encourage its daily use. The popularity of this devotion spread for about one hundred years, but then started to decline. In 1460, Blessed Alan de la Roche, a Dominican, was saying Mass one day, when Our Lord spoke to him in the Sacred Host. He said, "Alan, you have crucified Me once by your earlier sins, and now you are doing it again because I have given you the knowledge you need, but you are not preaching My Mother's Rosary. Since you are not doing this, you are guilty of the sins which others commit." This warning led Blessed Alan to preach about the Rosary at every opportunity. Devotion to the Rosary began to spread again, and continues to this day. The word Rosary means "Crown of Roses", and when said devoutly, honors Jesus and Mary. Each prayer carefully said is like a heavenly rose which will neither fade, nor lose its heavenly beauty. The Chronicles of St. Francis tell of a young friar who regularly prayed the Rosary before his evening meal. One day he was not able to do this, and so asked to be excused until he could. Because he was slow in returning, two other friars were sent for him. 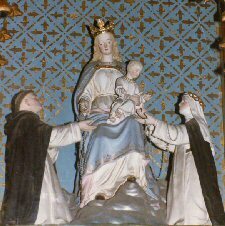 They, and then two others, found the first friar kneeling in his light-filled room facing Our Lady who was accompanied by two angels. Each Hail Mary he said became a beautiful rose which the angels placed before Our Lady as she smiled approval. Next to the Holy Sacrifice of the Mass, there is no other devotion more preferred by Our Lady. She highly regards those who work to preach the devotion, to establish it, and spread it. Likewise, she firmly punishes those who work against it. Our Lady has appeared on many occasions. Each time, she has left a loving message for us to heed and follow. She has made certain promises for those who recite her Rosary. 01. Whosoever shall faithfully serve me by the recitation of the Rosary shall receive signal graces. 02. I promise my special protection and the greatest graces to all those who shall recite the Rosary. 03. The Rosary shall be a powerful armor against hell, it will destroy vice, decrease sin, and defeat heresies. 04. It will cause good works to flourish, it will obtain for souls the abundant mercy of God, it will withdraw the hearts of men from the love of the world and its vanities, and will life them to the desire for eternal things. Oh, that souls would sanctify themselves by this means. 05. The soul which recommends itself to me by the recitation of the Rosary shall not perish. 06. Whosoever shall recite the Rosary devoutly, applying himself to the consideration of its Sacred Mysteries shall never be conquered by misfortune, God will not chastise him in His justice, he shall not perish by an unprovided death; if he be just, he shall remain in the grace of God, and become worthy of Eternal Life. 07. Whosoever shall have a true devotion for the Rosary shall not die without the Sacraments of the Church. 08. Those who are faithful to recite the Rosary shall have during their life and at their death the Light of God and the plentitude of His Graces, at the moment of death they shall participate in the Merits of the Saints in Paradise. 09. I shall deliver from Purgatory those who have been devoted to the Rosary. 14. All who recite the Rosary are My sons, and the brothers of My Only Son Jesus Christ. Pope John Paul II added an additional group of five mysteries to the Rosary; which now contains four aspects in the life of Christ and our salvation history. Annunciation - The Angel Gabriel announced to Mary she would become the Mother of God. Visitation - Mary visits Elizabeth and is greeted by her inspired salutation. Nativity - Christ is born of Joseph and Mary. Presentation - Christ's parents present him in the Temple and dedicate him to God. Christ is found in the Temple - Jesus absences himself from his parents. After three days of searching, they find him in the Temple, being "...about My Father's business." Agony in the Garden - Christ faces the suffering and death he will undergo, and prays for strength. Scourging at the pillar - Christ is beaten and whipped. Crowning with thorns - Thorns are fashioned into a crown and pressed in Christ's head. Carrying the cross - Sentenced to death, Christ must carry the cross upon which he will die to the ridicule of all. Crucifixion - Christ is nailed to the wooden cross, and is left on it to die. Resurrection - Christ rises from the dead. Ascension - Christ ascends into heaven. Descent of the Holy Spirit upon the Apostles and Mary - The Holy Spirit enters into Christ's inner circle and strengthens them to announce Christ's Gospel message to the world. Assumption of Mary - Mary, the Mother of God, is taken body and soul into heaven. Coronation of Mary - Mary is crowned in heaven as Queen of Heaven and Earth. Jesus is Baptized in the River Jordon - Jesus enters into his public ministry by accepting the baptism of repentance preached by John the Baptist. Jesus works His first miracle - The miracle at Cana wedding marks the first manifestation of his divinity. Jesus announced the Gospel message - Jesus' ministry was to announce the coming kingdom of God, His father, and die on the cross for our redemption. Jesus is transfigured - Jesus shows the glory of His divinity to His apostles. Jesus institutes the Holy Eucharist - Christ's presence continues to be with us for our spiritual strength. "In the name of the Father, the Son, and the Holy Spirit." I believe in God the Father almighty, creator of heaven and earth, and in Jesus Christ His only Son our Lord; who was conceived by the Holy Spirit, born of the Virgin Mary, suffered under Pontius Pilate, was crucified, died, and was buried. He descended into Hell. On the third day, He rose from the dead; He ascended into heaven, and sits at the right hand of God the Father almighty from whence He shall come to judge the living and the dead. I believe in the Holy Spirit, the Holy Catholic Church, the Communion of Saints, the forgiveness of sins, the resurrection of the body, and life everlasting. Amen. Our Father, who art in heaven; hallowed be Thy name. Thy kingdom come, Thy will be done on earth as it is in heaven. Give us this day our daily bread, and forgive us our trespasses as we forgive those who trespass against us. And lead us not into temptation, but deliver us from evil. Amen. Holy Mary, full of grace, the Lord is with Thee. Blessed are Thou among women and blessed is the fruit of thy womb, Jesus. Holy Mary, Mother of God, pray for us sinners, now and at the hour of our death. Amen. Glory be to the Father, the Son, and the Holy Spirit; as it was in the beginning, is now, and ever shall be. Amen. *Sunday and Wednesday-Glorious, Monday and Saturday-Joyful, Tuesday and Friday-Sorrowful, Thursday-Luminous. *Identify the first Mystery you will meditate upon. Recite: One Our Father, ten Hail Marys, and one Glory be. *Identify the Second Mystery you will meditate upon, and recite the prayers contained in the line above. *Do the same with the Third, Fourth, and the Fifth Mysteries. 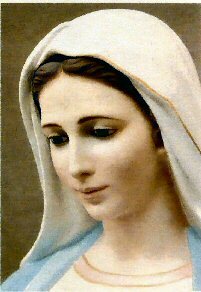 *After the final Glory be, conclude with a suitable prayer to Mary, such as the Memorare, above. to the children at Medjugorje.